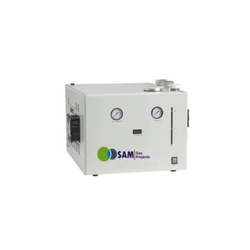 This Hydrogen generators use PEM technology (Proton Exchange Membrane) which allows the production of compressed, extremely pure Hydrogen without the need for external purification nor compression systems. Nuberg in strategic collaboration with purification equipment research institute (PERIC) of CSIC, offer Hydrogen Generator based on water electrolysis. Nuberg, along with PERIC provides high purity hydrogen gas-better than 99.999%, to meet a variety of our client's industries and advance technology application. - Flow rate 1 to 50 Nm3/hr. Hydrogen Gas Generators are available using various technologies depending upon the application , flow and purity requirements. The technologies available are (a) KOH Electrolyte based membrane separation technology (b) Pure Water Electrolysis Technology & (c) Palladium tube penetration technique. Our Hydrogen generators use PEM technology (Proton Exchange Membrane) which allows the production of compressed, extremely pure Hydrogen without the need for external purification nor compression systems. These are catalytic cracking units in which ammonia is dissociated to nitrogen and nitrogen. 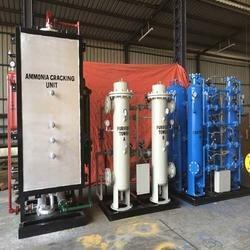 Commercial grade liquid ammonia from cylinders or tank is used as feedstock. The product gas has 75% hydrogen and 25% nitrogen. This gas is further purified in a molecular sieves unit by removing un-cracked ammonia and moisture. We provide Hydrogen gas generators of various flowrate ike 300 ml/min, 500 ml/min and 1000 300 ml/min. Parker hydrogen gas generators, available in a wide selection of models and configurations, produce a continuous flow of high-purity and ultra-high-purity hydrogen from de-ionized water and electricity. This hydrogen is used in a variety of carrier gas, fuel cell, fuel gas, reaction gas and gas chromatography applications.